Stems: Erect, slender, usually solitary, unbranched, densely pubescent above. Leaves: Mostly basal, simple, sessile, few, grass-like, more or less erect, linear or narrowly lanceolate, mostly 2.5 to 8 inches long, less than 3/5 inch wide; margins entire; tips pointed. Inflorescences: Spikes, slender, 2.5 to 6 inches long, with up to 50 flowers in single loose or tight spiral; floral bracts ovate to oblong-lanceolate, 1/4 to 1 inch long, hairy; tips tapering to points. Flowers: Usually perpendicular to stem, 1/4 to 1/2 inch long, almost tubular, whitish to yellowish white, outer surface pubescent; sepals 3, 1/5 to 2/5 inch long, petal-like; petals 3, lower petal larger, constricted at middle; tip with small rounded teeth. Fruits: Capsules, erect, egg-shaped, about 1/4 inch long; seeds numerous, tiny. Habitat: Moist prairies, meadows, ditches, and sandy woods, most abundant in loamy, acidic soils. 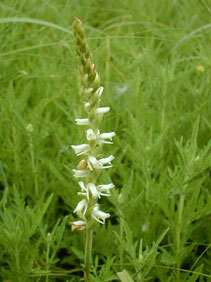 Comments: Spring lady's tresses blooms in the summer and lady's tresses and slender lady's tresses later, in the fall.